For a great selection of places to stay with discount prices visit Kelantan Hotels for more information. 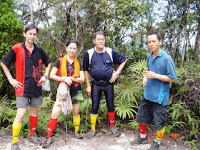 When 'Low Lee' (Old Lee) called and informed us the date of climbing Gunung Ayam, we were so excited because we have not been to any climbing trip since our last trip on 17th - 21st Sept 2006. (G.Yong Belar, G.Gayung & G.Korbu). 'Low Lee' is our organizer for most of the climbing trip to the 7G's. Since it is raining season our 4 members team (YK, KC, Michael & Hok Mew) decided to go ahead despite rain or sunshine. Despite our busy schedule we did some training before the trip. As usual I will plan the menu for 3D2N trip which include buying the food and packing them. On the night before the trip we met up and split the weight which include food stuff, cooking utensil, ground sheet/flysheet, burner and gas. We already have a standard packing list and a mini hand held weighing scale to check the member's carrying weight. Went and did some research on Gunung Ayam. 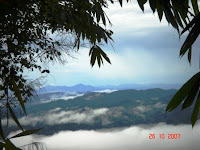 It is situated in the Jelawang Jungle (Mt. 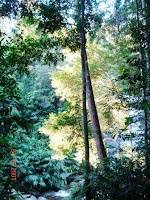 Stong State Park) near the village of Dabong in the State of Kelantan. Gunung Ayam (1480m) is among the highest in Kelantan. Gunung Ayam, Gunung Baha, Gunung Stong, Gunung Koh, Gunung Beirut, Gunung Che Tahir, Gunung Saji, Gunung Tera are all inter-connected. 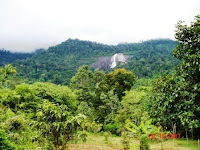 The famous Stong Waterfall which has a drop of 305m is believed to be the highest in South East Asia. It is also known as seven-tier waterfall. Our campsite will be at the peak of Stong Waterfall (Baha's Camp). Baha's camp has 2 large campsite and some huts for rental (which are not well maintained). At the base of Stong Waterfall there was a resort which has since ceased operation but you have to pay RM3 per head for entrance to Jelawang Jungle and RM3 per night at Baha Campsite. 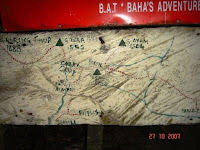 One also need to engage a guide to Baha's Camp (RM70), Gunung Ayam (RM80 for a group of 15). Make sure to confirm the price before the trip and guides are available at the entrance. Depart Kajang Town at 7.00am and reached Bentong Town at 8.00am for breakfast near the market. Did some last minute shopping for "Tow Foo Kuang" which Bentong Town is famous for its "tow foo" (bean curd). The meeting point was at Gua Musang where we have our lunch. After lunch we proceed to the base of Stong Waterfall which was an hour drive away. Before the current road was built, one has to walk through the village to take a boat ride across the river to the base. Now you just drive to the base and park your vehicle there. We reached the base at 2pm and it was raining heavily. Waited till 4pm and start trekking and reach Baha's camp at 4.45pm. Started pitching our tents and preparing dinner while YK and Hok Mew went to take photo of the 'Lover's Rock', which is the giant boulder at the edge of the Stong waterfall. 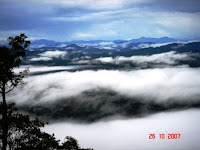 Here is well known for its spectacular sunrise and "sea of clouds". You can actually stand by the edge and view the whole of Kampong Dabong. One has to talk louder because of the roaring waterfall and sound of water gushing. Took plenty of pictures and video clips too! Tonight dinner was 'hokkien mee' and the noodle bought from Sg. Pelek and fish cake from Serdang. Supper was sweet potatoes soup with old ginger. It started raining again when we just about to finish our 'hockkien mee' and instead of having sweet potatoes as our supper, we have it as a dessert. Retired at 8.30pm very very early! as it was raining and the best thing is to sleep. Watch Video of waterfall and panaromic view from the top of Stong Waterfall. "Bangun! bangun!" (wake-up! wake-up!) our morning call by KC It was only 5.30am and we have "Tea Tarik" and biscuit at the Lover's Rock. Waited patiently for sunrise. A Glimpse of it and it was cover with cloud, the best time to come is in Mar - May. Went back to campsite to prepare porridge for breakfast (soak the rice the night before!). Fried eggs with 'udang kering' (dried shrimps) and 'kow choy' (vegetable). Hok Mew's wife prepared for us salted fish, 'kacang goreng' (fried groundnuts) and ikan bilis goreng (fried anchovies). Boiled sweet potatoes for trekking to the peak which is estimated to take 6 hours and we did it within 4 hours. Almost to the peak we stop at a last water point to refill. The guide told us there are two spots to collect the 'near one' an d the 'slightly fu rther one'. We just didn't think about it and collected from the 'near one'. The water tasted refreshing and cool. After taking a big gulp, KC and I refill our water bottle and walk up the slope. To our horror we saw fresh elephant dung about 10 steps away. Anyway it is the first time drinking water flavored with elephant dung, full of minerals Ugggghh!!!!. Had a good laugh and can't do anything about it. As we carry on, more elephant dungs, it looks as a herd of elephants may have pass here less than a week ago as the whole place looks very soggy and you can see big gaps and elephant foot prints along the trail. At the Gunung Ayam peak, more elephant dungs and foot prints and of course fresh dung aroma, KC boil water to make 'milo tarik' (hot chocolate malt drink), home bake fruit cakes and biscuit for lunch. Uncle Chew (oldest member at 66 yrs old) barter trade his glutinous rice dumpling for a cup of 'milo tarik'. Looking far we could see large cleared land for replanting possibly palm oil trees. After our lunch and group photos, we started descending at 1.25pm and reached the campsite at 3.45pm. After bathing, KC started washing and preparing the ingredients for cooking 'bak ku teh' without 'bak' (meat), vegetarian dish and rice for din ner. Just about to finish cooking, it started to rain again! After dinner we went inside the tent at 7.30pm. It was raining the whole night. An hour later water began seeping into our tents due to the heavy rain. Thoughts came to our mind that our tents were sitting on a water flow area and the extra flysheet that we put up was wrongly placed as water was flowing just over the zip opening. I went out to adjust the problem and notice the sound of water coming down the water fall was unusually loud and the river swell to almost 6 feet from our campsite level. Even though it was impossible for the water to reach our campsite, we stayed alert just in case. We have bad experience during our Gunung Tahan trip (Camp Putih) in Aug 2004 where the water flooded our campsite even though it was 12ft from water level. As the heavy rain subsided, we went back to sleep. Chris Lim here, representing Quachee Enterprise, would like to invite you to share your love and youe experience on travelling around Malaysia, and be a part of Malaysia 50 years Book, a book to commemorate Malaysia's 50 years of independance. You can share your photograph as well. p/s: deadline extend to 30 November 2007.